FILINVEST DEVELOPMENT Corp. (FDC) has deferred to next year plans to sell more shares to meet the required public float level, a ranking official yesterday said, citing improved prospects for 2012. CONGLOMERATE FILINVEST Development is eyeing a possible private placement in order to hike its public float level to a government-mandated level of 10%, an official said recently. FDC UTILITIES, Inc., the power arm of property developer Filinvest Development Corp., has bagged regulatory approval to increase its capital stock to P4 billion from P16 million, filings at the Securities and Exchange Commission showed. The documents showed that the plan was approved on Dec. 8. FDC Utilities President Jesus N. Alcordo said the move was made as the company wants to be “serious” in the power business. “A P16-million capital stock for a power company is too small. So if you really want to be serious about your power business, you have to increase your capital stock,” he said in a telephone interview yesterday. Mr. Alcordo said the increase was in preparation for the company’s future projects. Early this year, the company said it planned to spend as much as $1.8 billion to build a 1,650-megawatt portfolio of power-generating assets in the long term. Filinvest Development has posted a nine-month net income of P3.130 billion, down 17.93% from P3.814 billion last year. Shares of Filinvest Development slid .58% to P3.44 apiece yesterday. MANILA, Philippines -- The Gotianum-led Filinvest Development Corp. on Thursday said it has increased its stake in property unit Filinvest Land Inc. to 59 percent. In a disclosure to the Philippine Stock Exchange, Filinvest Development said it bought P1.31 billion worth of Filinvest Land shares through the stock market last month at a price range of P1.02 to P1.09 per share. Before the transaction, Filinvest Development owned 53 percent of Filinvest Land. Filinvest Land is planning to spend up to P12 billion in capital expenditures this year, banking on the steady growth of the property sector, as well as the business process outsourcing (BPO) industry. The real-estate firm is currently constructing two BPO office buildings in Northgate Cyberzone in Alabang, and another BPO building in Mandaluyong City. Filinvest Land is also expanding its Festival Supermall in Alabang, and is constructing the first phase of Il Corso, the lifestyle retail component of Citta de Mare in the South Road Properties in Cebu. LISTED Filinvest Development Corp. has moved to hike its investment in banking unit East West Banking Corp. (EastWest) by way of a P3-billion share subscription ahead of the bank’s projected capital hike, a disclosure to the local bourse showed yesterday. A stock analyst said EastWest Bank’s capital hike could be a prelude to an initial public offering this year. “There have been plans of listing EastWest on the PSE. The capital hike could be in preparation for that IPO,” Freya B. Natividad of online brokerage 2TradeAsia.com told BusinessWorld in a telephone interview yesterday. Conducting an IPO this year could be a strategic move for EastWest, Ms. Natividad pointed out. “Actually, it is good for banks this year given the market liquidity,” she said. A bank acquisition, however, is not likely in the near-term, Ms. Natividad said. with the news posted above..
i would think it will be a good catalyst for FDC share price appreciation..
having settled at the bottom for quite some time.. sudden interest shown (volume today) and with several brokers buying in.. seem to point to only one thing..
* roughly 60% upside to book value.. and with EWB IPO (bworld article above) that might provide as a catalyst... it will be a low risk high reward scenario again.. have my core and bought some more today using my WIN tsupita proceeds... sana tama! Good luck sa inyo dito, mukhang maganda future nito. 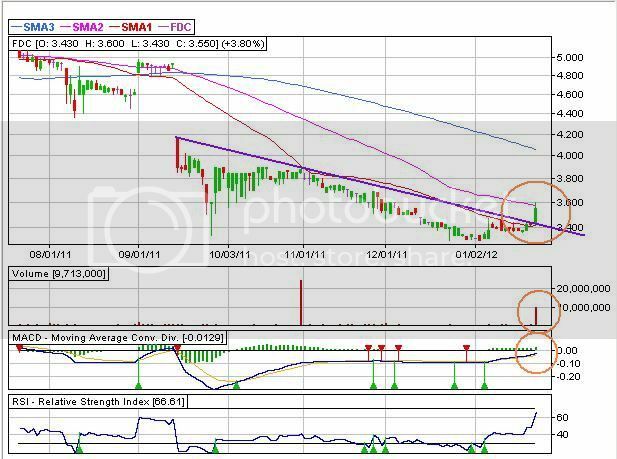 tagal natulog.. pero nung ipo ni CEB... JGS shot up from 5 to 20s..
ok na sa akin FDC from 4 to 8-10 thereabouts!